Andy Irvine, Irish Troubador, in town starting 10/11, tonight! How it’s New York: Andy Irvine is playing at small folk clubs in the area. And you’ve got several chances to see him, which is one of the pluses of being here. Some of his comrades in arms in music will turn up to watch, which is another. 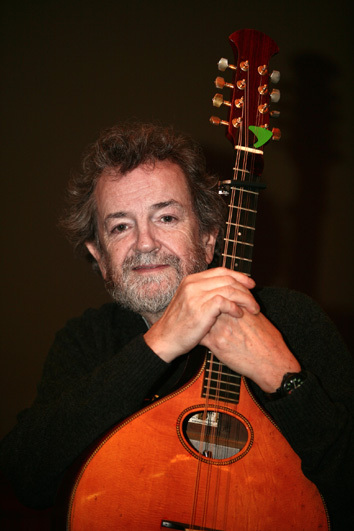 How it’s Irish: Andy Irvine is one of the most important names in Irish folk music, from Planxty (really from Sweeney’s Men) to Mozaik. He introduced Eastern European rhythms to the genre and as he demonstrated when we spoke, that final rhythm of Riverdance falls right into the genre. Andy’s in town to launch his latest CD Abocurragh, which came out last year. I did an interview with him for Irish Examiner which I’ll post tomorrow when it’s live, and if I can find time I’ll do a review of the CD as well. The short version: it’s pure, produced by Donal Lunny, with such artists as Liam O’Flynn, Máirtín O’Connor and Bruce Molsky. It’s kind of “old school,” not unlike what Moya Brennan and Cormac De Barra did with Voices and Harps. That is, there are Childs’ ballads here, including the dark “Three Huntsmen,” in which a damsel in distress is in league with the highwaymen (anybody else think of this when the Imp was talking about his failed marriage in HBO’s Game of Thrones? ); there’s “Willie of Winsbury,” which Andy told me is set to a tune that he found, though he’s never credited for it; there’s “The Demon Lover.” There are also new ballads Andy composed, very pro-labor and pro-IWW.